The Russia-China oil pipeline system is to transport the crude from fields in Tomsk region and the region of Khanty-Mansi Autonomous Okrug for export to the People’s Republic of China. The crude for this system is to be delivered from existing Omsk-Irkutsk and Krasnoyarsk-Irkutsk oil pipelines. The Russian section of the system crosses three regions of the Russian Federation (Irkutsk region, Republic of Buryatia and Chita region) starting in the city of Angarsk and terminating at the Chinese border near the Russian city of Zabaykalsk. This makes a total length of 1,452.40 km. 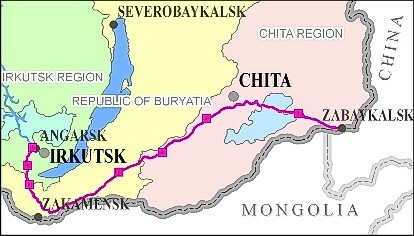 After crossing the border between the two countires the pipeline goes across China to the city of Datsin. 2002. Environmental Centre IFPA, Ltd. developed an Environmental Impact Assessment as part of the project at its Investment Feasibility stage. to the east from the Baikal, the route crosses the mountain ranges of the Trans-Baikalian country, such as Yablonovy and Chersky. Three options for the route alignment were reviewed in the EIA. The need for this alternative scrutiny was dictated by the fact that the route of the pipeline goes in close proximity to Tunkinsky National Park, which is a specially protected area of federal importance, and the lake of Baikal, which is a protected water body of international recognition. The project of the Russia-China pipeline system at its Investment Feasibility stage received a positive statement from the State Environmental Expert Review panel. At present the project is not being taken forward.